Have you ever wanted to grow your own vegetables, but you don't know if you'll be any good at it? There are a few veggies you can plant that will regrow or sprout when planted in the ground. You can even plant most of these veggies in a pot for easy growing in small spaces. An added bonus? They're affordable and a fun way to teach kids about plants. Some of these vegetables produce more vegetable, and some of them just sprout leaves. Keep reading to learn more about the type of vegetables you can grow from what you already have in the kitchen. While regrowing romaine lettuce is fun, you're not going to get a whole head of lettuce. Still, it's a fun way to let the kids see the fruits (or vegetables) of their labor. You'll need the bottom 1-inch of a bundle of lettuce. Place the stem in a shallow bowl of water on a windowsill. Change the water every few days.Within a week or two, you'll have enough new lettuce to put on top of a sandwich, according to Getty Stewart. You can enjoy the fresh taste of garden-grown asparagus nearly forever, with one planting. You'll need to plant the asparagus buds pointing up, in a whole deep enough to cover the bud. Asparagus roots take about a year to really develop, so don't expect a harvest right away, according to the New York Times. Over time, you'll need to remove dead stems, add some weed-free mulch and harvest regularly. If you enjoy adding ginger to your dishes, you'll love that growing your own batch is a snap! The Healthy Haven Blog recommends choosing a fat, smooth root (dry ones won't work well). Soak your root in a bowl of warm water for at least 8 hours (or overnight). After you've soaked the root, you'll need to cut it into a few pieces (each piece should have a nub where roots can sprout). Choose an easy-drain pot and partially bury the root. with the nubs facing up. You'll need to lightly spritz the soil each day and give it plenty of sunlight. Celery is a fun vegetable to grow with kids. All you need is the bottom of a celery bunch and a little bit of patience. You'll need the bottom 2-inches of a celery bunch. 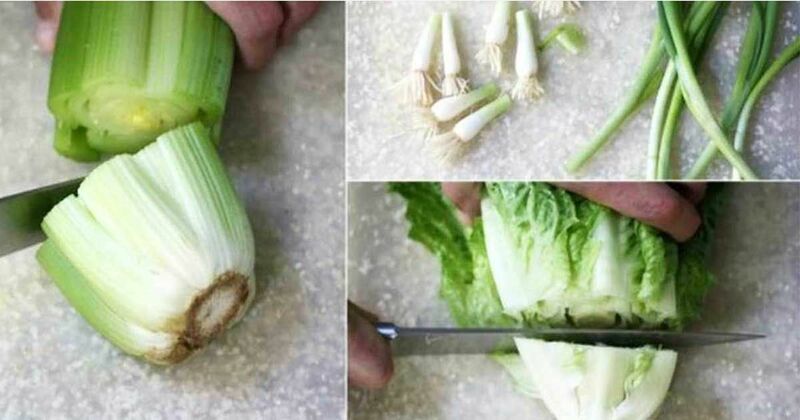 Rinse the celery stub, and allow it to sit in a shallow bowl of water for a week. You'll need to change the water every day. Once the outside begins to dry out and the center begins to sprout, your celery is ready to plant. Plant your celery in a sunny location. If you live in an apartment or other small space, use a small pot with drainage holes at the bottom. The plant needs a fair amount of moisture. Gardening Know How says full growth takes about three months. You can create an endless supply of garlic with a pot and leftover cloves. Choose an older clove of garlic that has already started to grow a bit. Gently remove the outer peel from the clove and plant the clove in a pot with the growing side pointed toward the sky. Your garlic needs plenty of sunlight and light watering. You'll know the garlic is ready to harvest when the sprouted green leaves shrivel. Pull from the pot and let the garlic dry before use. Want to try your hand at growing a veggie but lack space? Spring onions are a simple, space-friendly option (as a side note, spring onions are also known as shallots, scallions and green onions, according to The Micro Gardener. You'll need to plant and seed the onion if the one you are using doesn't have a bulb. You'll need to add moisture to the bulb of your green onion by soaking them in water before planting. No Dig Vegetable Garden says these onions take about 7 weeks to grow. Note: You aren't actually going to grow another carrot. You'll grow white flowers, but it's still fun to watch nature work. Carrots are a type of vegetable that can't be regrown after it's been cut off from the original plant, according to Gardening Know How. You'll need the top of a carrot you get from the store. Stick toothpicks into both sides of the carrot and balance the toothpicks on the edge of a cup. Then, fill the cup so the water just barely touches the bottom of the carrot. You'll see sprouts within a few days. Have you ever tried growing a vegetable from a root you already have on hand? Share your experience in the comments below.